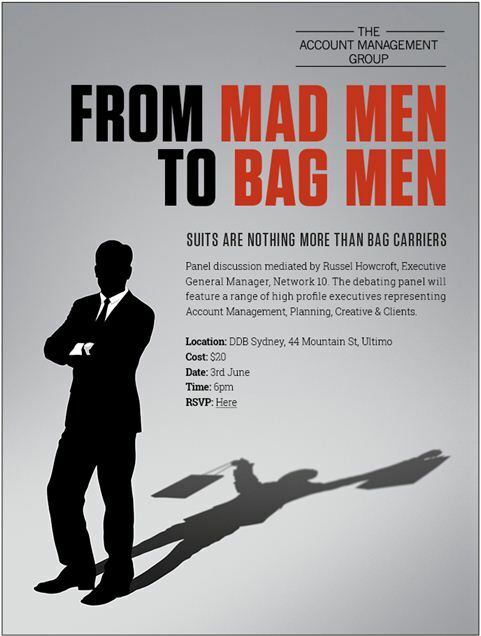 have advertising agency suits become nothing more than bag carriers? this was the somewhat provocative proposition of last night’s inaugural Account Management Group meeting. the panel, kept in order by Russel Howcroft, were Ian Perrin CEO ZenithOptimedia, Chantal Walker marketing director Foxtel, Nitsa Lotus GM TBWA, Steve Back CCO Ogilvy Australia, Bryan Jones technology director R/GA and Sudeep Gohil CEO of Droga5. a degree of Howcroft-style order-keeping was necessary, as the debate ranged from a pocket history of agency evolution (“The main thing that happened is that having one agency wasn’t good enough so we split it up … the account people, who were the glue, have been diminished and no one is managing the business” – Perrin) to more sporting analogies than I can recount. much debate centered around two issues … selling the work and understanding clients’ business. don’t we all Chantal, don’t we all? this was all followed by a quick foray into process, with Perrin making the (very correct IMHO) observation that “there’s so much focus on quality control that we’ve lost the ability to move quickly … we over-engineer everything in this industry. it takes six months to get a campaign out, the world has probably moved on by then.” … to which, hilariously (if I captured this correctly – and huge apologies if I didn’t) Lotus replied “it does take a long time but you need processes that protect the process.” genius. Perrin, who worked with a geek who understood the tech that IBM were trying to sell, cited fit of skill sets and passion for a clients business. Walker noted great AM was “resilient and persistent, always calm, trust them to be calm when I (the client) wasn’t.” Lotus noted that great AM doesn’t sell ideas, rather they sell bravery, and added that they’re new businesses and people- focused. quite. and this is perhaps what lies at the heart of the matter. implicit in the Madmen to BagMen assertion is that the very discipline of Account Management has eroded – and I do suspect that this is the case. a lot of last night’s debate felt like a lot of rather self-satisfied justification for the existence of Account Management in ad agencies. There is of course a genuine and real value in having people who understand clients’ business and galvanize action, but in which other industry would you have the indulgence of a whole bunch of people who’s job it is just to sit between the agency product and the client? the industry has changed more than a bit since the invention of Account Management. this may be the most obvious of suggestions, but perhaps we should all of us take responsibility for understanding our clients’ business and selling our work. plenty of other industries, including very creative ones, manage without a layer in the business to ‘manage an account’. I say this with full respect (some of my best friends are Account Management), but perhaps the elephant in the room last night was Account Management itself? big thanks to everyone who organised last night and made it happen – after all, its having the debate in the first place that counts.